Cricket Star free spins in Microgaming Online Casino! Released in 2015 during that year’s Cricket World Cup, Cricket Star is a 243 ways to win, 5 reel slot. The game features fun cricket-related graphics and ambient stadium sound effects. The slot offers players a number of exciting bonus features and an impressive 1,050,000-coin jackpot. 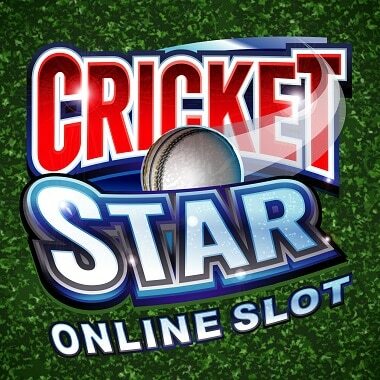 The Cricket Star online slot is based on the huge popular Break Away slot machine that appeals to players of all ages, experience levels and wallets. Bet easy with the following coin sizes: 0.01, 0.02, 0.05, and 0.10. You can bet up to 500 coins for a single spin. The maximum bet is 50.00 (euro, pounds, dollars, etc) and the minimum is only 0.50. You can win up to 105,000.00 as the main prize. With a 96-98% return to player, Cricket Star slot is a chance for cricket lovers to enjoy all the nuances of the game they love while taking a low-risk bet. The appearance of 3 or more Cricket Star Scatter symbols will trigger the slots Free Spins feature. This rewards players with up to 35 freespins at the same betting amount as the spin that triggered the feature. Once triggered, Free Spins play will feature a triggerable Rolling Reels™ bonus that will boost wins with a 10x multiplier. The Cricket Star Free Spins feature is not retriggerable. The Wild Wickets feature will supercharge winning potential with the reels 2, 3 or 4 turning Wild and completing guaranteed winning combinations. In addition, the slot’s Wild symbol will also appear by itself during normal play to substitute for other symbols and complete winning combinations.